We selected LANSA because it supports multiple platforms and multiple languages from a single application. REHAU AG+Co in Germany is one of the largest polymer processing companies in the world, manufacturing components for the construction, automotive and medical sectors and for virtually every other industry. REHAU developed ALN, a LANSA ERP system, deployed on 21 iSeries machines in 23 languages and used by staff at 170 locations worldwide. Business partners have web access and LANSA Integrator supports web services and XML transactions with third-party systems and SAP Financials. Thomas Luckner, team leader iSeries development at REHAU, says, "To give some indication of the system's size, ALN contains 1,500 files, 18,000 fields and 9,500 programs. The team that develops and maintains the system consists of six LANSA developers and one trainee. Those numbers should give you an indication of the productivity of our team and LANSA." With a team of six developers and one trainee, we developed and maintain a huge ERP system that is rolled out to over 20 iSeries machines worldwide in 23 languages. In the early nineties, REHAU reviewed the capacity of its IT infrastructure to support its fast-growing global business. REHAU had over 50 iSeries machines, one in every country of operation and several at the head office. On the local machines, REHAU ran an old COBOL-based ERP system migrated from IBM S/36 machines that had its roots in an even older sales and distribution system. "It didn't have a proper database behind it, lacked functionality and was not architected to support a multilingual environment like ours," explains Luckner. "We looked at solutions from several ERP vendors, but it is very expensive to license a solution on many systems. Plus none of the packaged solutions were a good match. It made sense to develop our own solution." "We initiated a project to completely redesign and redevelop the ERP system. We started with Synon, but after a year we found it too static and not a good way to continue." "By then it was 1996 and it was not certain that we would stay on the iSeries. We envisioned that our smaller locations would run on PC servers, while our larger locations would remain on the iSeries. So, we looked for a tool that could support multiple platforms using the same software. We also wanted the tool to be able to support multiple languages from a single application." "This narrowed it down to LANSA. Another plus for LANSA was the imminent release of the first version of its web development tool, because we knew that further down the project we wanted to give our customers web access to the system," says Luckner. 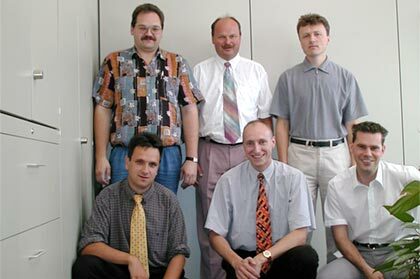 REHAU started the project of re-architecting its ERP system with LANSA in 1996 and has always developed in a PC environment, initially with LANSA PC/X on OS2, which evolved to become LANSA for Windows and is now Visual LANSA. "We code, test and debug in Visual LANSA in the Windows environment and then move the application to the iSeries. Developing in Windows is easier and far more productive and the compile times are faster," say Luckner. Luckner, with only one other developer, used LANSA's modeling and prototyping tool, LANSA RUOM, to generate the first pass of the ALN ERP system. This created all file and field definitions, business rules and validations, messages, help text and all fundamental entry, update, search and list programs. ALN was then further expanded and fine-tuned and went live in 1998 at a small sales office in Belgium, just two years after the redevelopment project started. In the following years, the system was rolled out to the majority of REHAU's 170 locations, in 23 language areas. This involved 48 iSeries machines that have recently been consolidated to 21 machines. ALN now supports thousands of internal users worldwide. REHAU uses LANSA's multilingual facilities to store field labels, messages and system variables in 23 different languages including German, English, French, Dutch, Russian, Spanish, Turkish, Greek, Macedonian, Finish, Danish and many others. REHAU has its own automated translation routines that run over the LANSA files. "It really pays off to put in the effort to create standards, fine tune program templates and store all components and definitions in the LANSA Repository. It boosts development productivity and creates good quality programs that all have a very consistent look, feel and behavior, which makes it much easier to train end users, " says Luckner. ALN has modules for bid and tender, order fulfillment, invoicing, CRM, warehouse management, consignment management, dispatching, freight settlement, purchasing, supplier management, just-in-time order generation and EDI interfaces for ordering, invoicing and dispatching. Users can choose between ALN's native iSeries user interface (5250) and a Windows interface generated by a refacing tool. Although ALN can run in a Windows environment, REHAU did not go ahead with the original plan to install PC servers at small locations. Luckner explains that, "With the arrival of the very modestly priced small iSeries models, we didn't see a reason anymore. The iSeries is cheaper to run than PC Servers and are easier to manage remotely." LANSA's Repository and templates boost development productivity and help to create consistent quality programs. Several LANSA-based web solutions now give business partners and remote employees access to the ALN system, including a Customer Portal for business partners and a mobile computing portal for traveling staff. "By making our IT system available on the web, in real time and using the same data as our internal staff, we have made ourselves accountable and transparent," says Luckner. REHAU uses LANSA Integrator for a variety of direct M2M communications between regional locations, with its zSeries SAP system and with external parties. REHAU's first LANSA Integrator implementation was a dealer finder solution for REHAU's website that consumes a web service from MAP24, a specialist in maps and routing calculations. For example, someone who wants to have REHAU window frames installed in his house can visit REHAU's website and fill out a form, hosted by MAP24.com, which finds the six nearest REHAU dealers and sends this and the customers information to REHAU's iSeries. The relevant sales office then contacts the prospective buyer and dealers, improving customer service. LANSA Integrator is also used to send updated dealer information to MAP24 in XML format. REHAU also uses LANSA Integrator to exchange transactions in real time between its sales offices and its central SAP Financials system on zSeries via BizTalk Server. Currently this is used for item information and special prices and will soon include transactions for invoices, credit information and contracts. Although in a proof of concept REHAU used LANSA Integrator to expose and consume SOAP web services directly with SAP, BizTalk was selected as the intermediary between SAP and the iSeries ERP due to the availability of predefined SAP connectors. REHAU's local iSeries machines exchange transactions and statistics on large building projects and customers that affect multiple regions, with a combination of LANSA Integrator's SQL Service and web services. LANSA Integrator is also used to exchange data in CSV format with other parties. For example, companies that deliver to REHAU's customers can provide their delivery schedule in an Excel spreadsheet. Details are imported into the iSeries database using LANSA Integrator. This results in up-to-date delivery advice when entering customer orders. "LANSA Integrator also gives us access to a lot of powerful third-party Java classes," says Luckner." This makes it easy to extend your application without having to program in Java yourself. There is a lot freely available. For example, we have just implemented a Java class for random password generation." "LANSA Integrator solutions are easy to implement and maintain, flexible and robust. Being able to handle all these integration requests with a single tool and single skill set is an enormous advantage," says Luckner. LANSA Integrator solutions are easy to implement and maintain, flexible and robust. "It is good to know that LANSA supports multiple server platforms, but the iSeries is and remains our preferred ERP platform because of its stability and low cost of ownership," says Luckner. "We are happy with our iSeries infrastructure and we plan to exploit it for all that is possible." "We develop everything for the iSeries with LANSA and we do the website and integration projects with our own small team as well. LANSA provides the most practical solution for us and is always one of the first to make new technologies, such as web services, available on the iSeries." "The larger the system, the more benefits you get from LANSA's Repository, because the re-use of components is extensive. Without LANSA, we would not have been able to develop and manage a large system like ours. Not with this functionality, not with this complexity. We would not be able to have an overview. With the LANSA Repository and its Impact Analysis capabilities, we can manage a large system like ours." "LANSA gives us enormous productivity. Using templates, we can develop consistent programs in minutes that used to take us days in Cobol." "With a team of six developers and one trainee, we developed and maintain a huge ERP system that is rolled out to over 20 iSeries machines worldwide in 23 languages," concludes Luckner. Without LANSA, we would not have been able to develop and manage a large system like ours. REHAU AG+Co, headquartered in Rehau, Germany, was established in 1948 and is one of the largest polymer processing companies in the world. REHAU manufactured components are used in the automotive, medical, construction, furniture and many other industries. From advanced automotive systems, uPVC window and door designs, furniture trim components for the residential and commercial marketplaces, tubing for the beverage dispensing industry to underfloor heating and high-strength polymer piping for the construction industry - REHAU provides customers with first-class solutions. REHAU employs 14,000 people at 170 locations worldwide. Revenue in 2004 was 1.1 billion Euro. REHAU's iSeries IT team consists of seven developers and two people who manage 26 iSeries machines ranging from 170 to 520/830 models. There is a staff of 20 people to support the users at the locations, provide training and collect change requirements. The LANSA-based ALN ERP system integrates with SAP, Microsoft BizTalk Server and MAP24.